Is a paste version of Duragloss AP. Easily cleans and shines aluminum and many other metals such as silver, copper, brass and chrome. 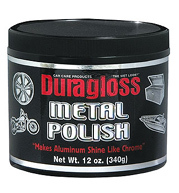 this product has got to be the BEST metal polish to buy! i've used this product on chrome wheels,stainless steel and other types of metal surfaces and it always performs to the highest standards.GREAT BUY !